Lindsay Eagar is the author of the novel Hour of the Bees. She lives in the mountains of Utah with her husband and daughters. Eagar’s novel never lags or loses heart, and it’s irresistibly baited with a cursed treasure hoard, danger, and candy. Flashback chapters fill in important backstory on Merrick, and readers will adore Fidelia for the passionate and clever heroine she is. Refreshingly, women are as likely to captain a ship as plunder it in this fictional world, a small but enriching detail. Earnest and exciting, this swashbuckling voyage of self-discovery sparkles even when threatened by the stormiest seas. The tidal pull of Eager’s swashbuckling pirate adventure has its source in 11-year-old Fidelia Quail...Set in a world that combines futuristic and historical elements to intriguing effect (Fidelia wears a pinafore, but knows her way around “Hydro-Scanners” and other tech), this is an exciting maritime adventure with a strong, layered heroine. This fantastical tale, set in an indeterminate time and place, is chock-full of humor and swaggering pirate adventure...An old-fashioned, rip-roaring adventure featuring a smart, independent girl. The tale makes an effective read-aloud...More than just another lively pirate adventure, this novel celebrates science, invention, and the pursuit of knowledge while sensitively exploring loss. This suspenseful novel is a great middle school read and yields a happy ending as Fidelia pursues her dream of becoming a famous scientist like her parents. Fidelia’s emotional compass is sensitively and accessibly handled in the midst of her harrowing adventures on a dodgy craft...Fidelia’s problem-solving skills as well as her courage and ambition mark her out as a worthy hero for budding scientists and armchair adventurers. 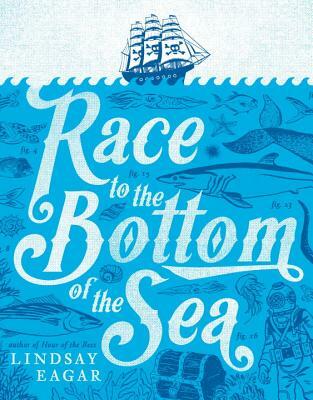 "Race to the Bottom of the Sea" has something for every reader: science, beautiful imagery, treasure, danger, self-discovery, robotics, all things pirates and so much candy. This beautifully written and unusual novel features an 11-year-old shark-loving marine inventor named Fidelia Quail...Eagar, author of "Hour of the Bees," has crafted a thrilling narrative that is part pirate adventure, part love story and part coming-of-age tale.